Hypertension (HTN) is considered a major predominant disease with different comorbidities such as diabetes and cardiovascular and renal disorders. Pharmacological methods in addition to nonpharmacological methods play a major role in reducing high blood pressure (BP) that might also offer safe and effective alternatives to drug therapy. Dietary and behavioral techniques are mainly centered so far by the researchers. The purpose of this article is to achieve positive therapeutic outcomes by reviewing evidence-based nonpharmacological treatments and evaluation of patients with HTN. MEDLINE, PUBMED databases were used to review relevant information. HTN with different comorbidities is not only raising the mortality rates but also health-care costs. The monetary burden for nonpharmacological treatment was considered less cost-effective than drug therapy. It is emphasized that providing patient information leaflet with lifestyle modifications can positively influence patients to marque the lifestyle changes. Hypertension (HTN) is considered a silent killer with major risk factors such as chronic heart failure, chronic kidney failure, stroke, and coronary heart disease. The overall world population having HTN with ethnic variation is about 28–44% at a cutoff of 140/90 mmHg. The estimated pervasiveness of HTN in Indian population is approximately 25% among urban adults and 10% in the rural zones. The uncertainty of HTN in one's lifetime is estimated to be 90%. As per the Eighth Report of the Joint National Committee (JNC) on prevention, detection, and treatment of high BP, the targeted BP should reach within a month of drug therapy in either ways by doubling the dose of the first drug or by combing it with other antihypertensive to increase the effect. In present days, the patients aged less than 60 years are not only initiating the pharmacotherapy at a BP of 140/90 mmHg but are also adopting nonpharmacological methods such as lifestyle modifications with increasing prominence., Nonpharmacological methods that are dramatically tapering the BP are limited alcohol consumption, augmented exercise, entertainment, weight loss, recreational activities, cut salt intake, and the dietary approaches to stop hypertension (DASH) diet [Table 1]. Eventually, the target of anti-HTN therapy is to cut down cardiovascular and renal morbidity and mortality rates. Despite the availability of several guidelines and pharmacological and nondrug therapies, it is hard for most of the hypertensive patients to reach an adequate BP. Such unsatisfactory low-lying control rates may be because of insufficiency of information, failure to augment the treatment, noncompliance of the patient's with treatments, and the need of giving importance to supportive and nonpharmacological approaches. The ubiquity and undertreatment of HTN combined with its imaginably serious consequences emphasize the immediate attention needed to reinforce the clinical exertions to control HTN and aid patients to attain the target measures. In addition to the wide use of antihypertensive drug therapy, nonpharmacological therapy for primary prevention and adjunctive treatment aids in maximizing the therapeutic remunerations of the HTN management., The Seventh Report of the JNC on prevention, detection, evaluation, and treatment of high BP recommends the health-promoting lifestyle changes (e.g., reduced sodium intake, increase physical activity, and smoking cessation) as the initial therapy for all patients with hypertensive and prehypertensive disorders. Educating the patients by providing patient information leaflet, meditation, yoga, breathing exercises, and stress management techniques is also an additional supporting nondrug intervention.,,, Initial therapy in Stage-1 HTN can serve as nonpharmacologic therapies and act as a complement to medication in patients who are already on drug therapy. The patient's death rate with stroke and coronary heart disease can be reduced to 8% and 5%, respectively, by a reduction in systolic BP by 3 mmHg. Annually the outpatient visit of the patients with HTN is about 35 million (defined as the BP <140/90 mmHg) which is not only the most commonly diagnosed disorder in the United States but also the primer for fatal and nonfatal cardiovascular issues., Women and older adults in Africa are mostly affected by HTN and overweight or obese patients or those with family history of high BP, diabetes, or pre-HTN are also prone to high risk of HTN., Diabetic patients may be prone to 1.5 to 3 times higher rate of prevalence of HTN than those without diabetes. As per the JNC VIII guidelines, the target BP that needs to be attained is 140/90 mmHg. HTN associated with cardiovascular disorders is the leading cause of death rates in United States Population. The health of an individual is influenced by a number of factors, such as environmental, biological, psychological, and socioeconomic factors, these all together termed as lifestyle factors which need to be changed when there are risk factor with HTN. Therefore, the lifestyle modifications that are aimed to prevent one disease reduces the risk of other diseases. The adoption of the DASH has been shown to reduce systolic BP. The dietary habits and nutrition need to be monitored as a part lowering BP. The clinicians should recommend the patient to reduce salt, carbohydrates, protein, fat intake and to increase the consumption of calcium-rich diet, such as almond milk and soy milk; food prepared with calcium; potassium-rich food, such as beans, dark leafy vegetables, potatoes, squash, yogurt, fish, avocados, mushrooms, bananas with daily value of 3.5 g.; magnesium-rich food, such as nuts, seeds, fish, whole grains, dry fruits, dark chocolate with daily value of 400 mg. Consuming a foodstuff rich in fruits and vegetables and low-fat dairy products, increasing the intake of fiber-rich food, and decreasing the amount of animal protein all these dietary habits also play a major role in reducing the BP. The patients were asked to maintain a diet book of their food intake for minimum of 3 days, which were later evaluated all together. This increases the patients' alertness to dietary habits and put their interest in making other healthful changes. Careful documentation of these diet books help the patient to identify the state of water loss, which is a significant feature in overall health, reduction in weight, and sodium retention. Most of the heart diseases are linked up with high intake of dietary sodium. Reduced intake of dietary sodium combined with weight loss compared to salt avoidance alone at lowering BP shows the weak evidence. Most of the patients who are advised to reduce salt intake in combination with thiazides diuretics the electrolytes levels need to be monitored especially in elderly patients, which may lead to hyponatremia. Therefore, these patients are advised to take foodstuffs that contain less salt and reduce the sodium intake to <2.4 g. As a part of this diet regime, the patients were taking a diet rich in fruits and vegetables, potassium, and low-fat dairy foodstuffs., The intake of dietary supplements was also recommended. A clear relation between the higher intake of alcohol and rise of BP has been reported in many studies. The usual limits of alcohol intake for men (2 drinks/day) and women (1 drink/day)., Alterations in the levels of BP in normotensive and hypertensive men have been reported by various research groups. The intake of alcohol by normal and hypertensive patients lowers the BP., Those who consume alcohol in excess are less compliant with the anti-HTN regimens. As there are convincing evidences that alcohol (<2 drinks/day) has a cardioprotective effect that is facilitated through increased HDL-2; therefore, there is a need to be vigilant about recommending the overall abstinence from alcohol. Reducing weight has the biggest effect on those who are overweight and already have HTN. Overweight and obesity are also the major risk factors of hypertension as the obesity rates increases the prevalence of hypertension increases and if the body mass index is greater than 25, it is considered as overweight and if 30 or greater said to be obese. The patients are encouraged to maintain a normal BMI by taking low-calorie diet, physical exercise, and upholding normal body weight., The weight management programs make the patients gain new knowledge about foods and supplements. Generalized directions given by the physicians will not foster the completion of new activities. Reminding their dietary goals helps the patient achieve normal BP. A dietitian can also be advocated in some cases detailed diet evaluation and guidance. For comprehensive evaluation of the patient's preferences and daily deeds, constraints need to be noted before instructing a patient to exercise. Thirty minutes 3 times per week is often recommended for every individual and four short spurts (10 min each) of cardiovascular exercise each day is as effective as the usual recommendation of 30 min., Sedentary patients need to complement the short bursts of activity to their day. Unpretentious recommendations such as parking the car at a far-off distance from the occupied destination or taking the stairs at home few minutes each day may help increase the tolerance to exercise and improves the commitment. Pedometers can also serve as added motivational source that measures cumulative bouts of activity and afford an update about the activity. Increase in time spent exercising may also be obtained from advantage from community-based group exercise programs. between smoking and high BP., It is a challenging task because of the absence of early symptoms in the disease progression. Improved results from tobacco cessation treatment can be attained only when the patient better understands the risk factors associated with smoking (increase in secondary cardiovascular complications and enhance the progression of renal insufficiency). The treatment for smoking cessation includes nicotine replacement products, cessation psychotherapy at each visit, and prescription drugs. Alternative therapies, such as telephone/mobile and web-based smoking cessation programs, may also aid in the betterment of individual therapy. Whole grains, fat-free or low fat milk foods, fruits, vegetables, seeds, beans and unsalted nuts, and other whole foods that are rich in potassium may reduce the BP by 5.5/3.0 mmHg compared to potassium supplements. The intake of salt will have a significant impact on the potassium intake that in turn alters the BP. 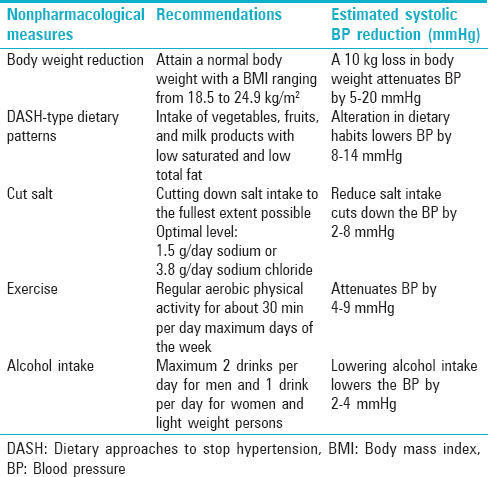 Nevertheless, the reduction in BP is highest when less amount of salt with less amount of potassium are taken. Alterations in the intake of potassium leads to hyper- or hypokalemia in people with impaired renal function and is recommended for only people with normal renal function. Omega-3 polyunsaturated fatty acids resulted in reduction of BP by 2 mmHg but more benefits were found by adding fatty fish to their diets., Fish oil supplements in higher amount attenuate the BP in hypertensive patients by 4/2.5 mmHg. Other alternatives such as coenzyme Q10, garlic, and vitamin C may also cut down the blood pressure. The attention of the number of patients toward complementary and alternative medicine (CAM) therapies is rising considerably. CAM therapy helps the brain to have a better control over the functioning of the body and controls the symptoms. Techniques, such as yoga, meditation, and relaxation, are a few prospective aids in attenuating BP., According to the recent reports on lifestyle interventions, it is clearly evident that reductions in BP are higher with the aid of relaxation techniques in comparison with nonintervention controls., Mind-body practice (Yoga) has been reported as one of the popular CAM therapies, which is effectively controlling BP. In spite of all these advantages, more studies need to be carried out to evidently put forward the results as a support to the patients who wish to practice these CAM therapies for complete health and well-being. In hypertensive as well as nonhypertensive individual's lifestyle, modifications, previously termed as nonpharmacologic therapy, play a major role. Before initiation of drug therapy, lifestyle modifications are recommended in hypertensive individuals with stage 1 HTN and as a support to the patients who are already on drug therapy. Any range of pressure is always associated with BP and risk of cardiovascular disease that may lead to varying intensity of strokes and heart attacks. As a daily routine, nonpharmacological interventions should be practiced making a note that some nonpharmacological interventions reduce the pressure to a lesser degree compared to pharmacological therapy. Wolf-Maier K, Cooper RS, Banegas JR, Giampaoli S, Hense HW, Joffres M, et al. Hypertension prevalence and blood pressure levels in 6 European countries, Canada, and the United States. JAMA 2003;289:2363-9. Vasan RS, Beiser A, Seshadri S, Larson MG, Kannel WB, D'Agostino RB, et al. Residual lifetime risk for developing hypertension in middle-aged women and men: The Framingham Heart Study. JAMA 2002;287:1003-10. Wood S. JNC 8 at last! Guidelines ease up on BP thresholds, drug choices. Heartwire. December 18, 2013; Accessed December 30, 2013. Chobanian AV, Bakris GL, Black HR, Cushman WC, Green LA, Izzo JL, et al. Joint National Committee on Prevention, Detection, Evaluation, and Treatment of High Blood Pressure. National Heart, Lung, and Blood Institute; National High Blood Pressure Education Program Coordinating Committee. Seventh report of the joint national committee on prevention, detection, evaluation, and treatment of high blood pressure. Hypertension 2003;42:1206-52. Hajjar I, Kotchen TA. Trends in prevalence, awareness, treatment, and control of hypertension in the United States, 1988-2000. JAMA 2003;290:199-206. Köllmer M, Popescu C, Manda P, Zhou L, Gemeinhart RA. Stability of benzocaine formulated in commercial oral disintegrating tablet platforms. AAPS PharmSciTech 2013;14:1333-40. Chobanian AV, Bakris G, Black H, Cushman W, Green L, Izzo Jr J, et al. National Heart, Lung, and Blood Institute Joint National Committee on Prevention, Detection, Evaluation, and Treatment of High Blood Pressure; National High Blood Pressure Education Program Coordinating Committee. The seventh report of the joint national committee on prevention, detection, evaluation, and treatment of high blood pressure: The JNC 7 report. 2003;289:2560-72. Astin JA, Shapiro SL, Eisenberg DM, Forys KL. Mind-body medicine: State of the science, implications for practice. J Am Board Fam Pract 2003;16:131-47. Elliott WJ, Izzo JL Jr. Device-guided breathing to lower blood pressure: Case report and clinical overview. MedGenMed 2006;8:23. Loria MJ, White SW, Robbins SA, Salmeto AL, Hymel KA, Murthy SN, et al. Brain-derived neurotrophic factor response in vulnerable and resilient genetic lines in the chick anxiety-depression model. Behav Brain Res 2013;245:29-33. Raub JA. Psychophysiologic effects of Hatha Yoga on musculoskeletal and cardiopulmonary function: A literature review. J Altern Complement Med 2002;8:797-812. Roumie CL, Elasy TA, Greevy R, Griffin MR, Liu X, Stone WJ, et al. Improving blood pressure control through provider education, provider alerts, and patient education: A cluster randomized trial. Ann Intern Med 2006;145:165-75. Stamler J, Stamler R, Neaton JD. Blood pressure, systolic and diastolic, and cardiovascular risks: US population data. Arch Intern Med 1993;153:598-615. Woodwell DA, Cherry DK. National ambulatory medical care survey: 2002 summary. Adv Data 2004;1-44. Manda P, Sammeta SM, Repka MA, Murthy SN. Iontophoresis across the proximal nail fold to target drugs to the nail matrix. J Pharm Sci 2012;101:2392-7. Wang TJ, Vasan RS. Epidemiology of uncontrolled hypertension in the United States. Circulation 2005;112:1651-62. Jandeleit-Dahm K, Cooper ME. Hypertension and diabetes. Curr Opin Nephrol Hypertens 2002;11:221-8. Association AH. Heart disease and stroke statistics-2005 update. Dallas (TX): American Heart Association; 2005. p. 1-63. Prevention CfDCa. Prevention Works: CDC Strategies for a Heart Healthy and Stroke-Free America. Washington, DC: American Heart Association; 2006. p. 1-88. Popescu C, Manda P, Juluri A, Janga KY, Cidda M. Enhanced dissolution efficiency of zaleplon solid dispersions via modified ƒÀ-Cyclodextrin molecular inclusion complexes. J Pharm Pharm Scien 2015;1:1-10. McCraty R, Atkinson M, Tomasino D. Impact of a workplace stress reduction program on blood pressure and emotional health in hypertensive employees. J Altern Complement Med 2003;9:355-69. Elmer PJ, Obarzanek E, Vollmer WM, Simons-Morton D, Stevens VJ, Young DR, et al. PREMIER Collaborative Research Group. Effects of comprehensive lifestyle modification on diet, weight, physical fitness, and blood pressure control: 18-month results of a randomized trial. Ann Intern Med 2006;144:485-95. Liu L, Ikeda K, Sullivan DH, Ling W, Yamori Y. Epidemiological evidence of the association between dietary protein intake and blood pressure: A meta-analysis of published data. Hypertens Res 2002;25:689-95. Streppel MT, Arends LR, van't Veer P, Grobbee DE, Geleijnse JM. Dietary fiber and blood pressure: A meta-analysis of randomized placebo-controlled trials. Arch Intern Med 2005;165:150-6. Manda P, Angamuthu M, Hiremath SR, Raman V, Murthy SN. Iontophoretic drug delivery for the treatment of scars. J Pharm Sci 2014;103:1638-42. Lung NH, Institute B. Clinical guidelines on the identification, evaluation, and treatment of overweight and obesity in adults [NIH Publication No. 98-4083]. National Institutes of Health 1998;1-262. Available from: https://www.nhlbi.nih.gov/files/docs/guidelines/ob_gdlns.pdf. [Last accessed on 2015 Sep 19]. Cushman WC, Cutler JA, Hanna E, Bingham SF, Follmann D, Harford T, et al. Prevention and treatment of hypertension study (PATHS): Effects of an alcohol treatment program on blood pressure. Arch Intern Med 1998;158:1197-207. Xin X, He J, Frontini MG, Ogden LG, Motsamai OI, Whelton PK. Effects of alcohol reduction on blood pressure: A meta-analysis of randomized controlled trials. Hypertension 2001;38:1112-7. Franco V, Oparil S, Carretero OA. Hypertensive therapy: Part II. Circulation 2004;109:3081-8. Manda P, Hargett JK, Vaka SR, Repka MA, Murthy SN. Delivery of cefotaxime to the brain via intranasal administration. Drug Dev Ind Pharm 2011;37:1306-10. Hypertension in America: A National reading. Am J Manag Care 2005;11(Suppl):S383-5. Obesity NAAftSo, Heart N, Institute B, Health NIo, Initiative NOE. The practical guide: Identification, evaluation, and treatment of overweight and obesity in adults: National Institutes of Health, National Heart, Lung, and Blood Institute, NHLBI Obesity Education Initiative, North American Association for the Study of Obesity; 2000. Appel LJ, Champagne CM, Harsha DW, Cooper LS, Obarzanek E, Elmer PJ, et al. ; Writing Group of the PREMIER Collaborative Research Group. Effects of comprehensive lifestyle modification on blood pressure control: Main results of the PREMIER clinical trial. JAMA 2003;289:2083-93. Park S, Rink LD, Wallace JP. Accumulation of physical activity leads to a greater blood pressure reduction than a single continuous session, in prehypertension. J Hypertens 2006;24:1761-70. Yang Y, Manda P, Pavurala N, Khan MA, Krishnaiah YS. Development and validation of in vitro-in vivo correlation (IVIVC) for estradiol transdermal drug delivery systems. J Control Release 2015;210:58-66. Stovitz SD, VanWormer JJ, Center BA, Bremer KL. Pedometers as a means to increase ambulatory activity for patients seen at a family medicine clinic. J Am Board Fam Pract 2005;18:335-43. Clark MA, Hogan JW, Kviz FJ, Prohaska TR. Age and the role of symptomatology in readiness to quit smoking. Addict Behav 1999;24:1-16. Whelton PK, He J, Cutler JA, Brancati FL, Appel LJ, Follmann D, et al. Effects of oral potassium on blood pressure. Meta-analysis of randomized controlled clinical trials. JAMA 1997;277:1624-32. Xu X, Al-Ghabeish M, Rahman Z, Krishnaiah YS, Yerlikaya F, Yang Y, et al. Formulation and process factors influencing product quality and in vitro performance of ophthalmic ointments. Int J Pharm 2015;493:412-25. Morris RC Jr, Sebastian A, Forman A, Tanaka M, Schmidlin O. Normotensive salt sensitivity: Effects of race and dietary potassium. Hypertension 1999;33:18-23. Dickinson HO, Mason JM, Nicolson DJ, Campbell F, Beyer FR, Cook JV, et al. Lifestyle interventions to reduce raised blood pressure: A systematic review of randomized controlled trials. J Hypertens 2006;24:215-33. Wilburn AJ, King DS, Glisson J, Rockhold RW, Wofford MR. The natural treatment of hypertension. J Clin Hypertens (Greenwich) 2004;6:242-8. McCaffrey R, Ruknui P, Hatthakit U, Kasetsomboon P. The effects of yoga on hypertensive persons in Thailand. Holist Nurs Pract 2005;19:173-80. Innes KE, Bourguignon C, Taylor AG. Risk indices associated with the insulin resistance syndrome, cardiovascular disease, and possible protection with yoga: A systematic review. J Am Board Fam Pract 2005;18:491-519.